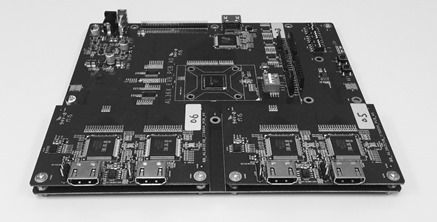 This evaluation board (EVB) , AL362B-EVB-A0 demonstrates 4K Quad Display function with HDMI video input signals. This EVB includes HDMI Receivers, IT6604 which supports four 1080 FHD inputs, and IT6604 function can be enabled through AL362’s internal MCU. There are two output ports designed on this EVB. One is HDMI output through HDMI transmitter chip (Silicon Image Sil9176), and the other one is digital output connector through the AL362 output bus. There are more hardwares designed on this EVB, such as keypads, and GPIO. It has many video display modes and users interfaces, such as 4K quad view, 4K picture-in-picture and 4K full screen. These functions can be uploaded by an USB Debug Tool. Four 1080 60p HDMI signal inputs and 4K2K HDMI output. 4K2K quad view, PiP, PoP and full screen display. ISP (In-System-Program) program upload supported.